Mary Pickford is the undeniable queen of the silent era. She was the most prominent female star of the silent era. Her fame earnt her the title of “America’s Sweetheart”. At her peak, the only actor who matched her fame and box office draw was Charlie Chaplin. Her talent as an actress and instinct for how to perform helped transform early filmmaking. Later, she became the most influential woman in Hollywood, during a time when feminism was on the rise. Here are ten facts you should know about the Queen of the silent screen. 1. 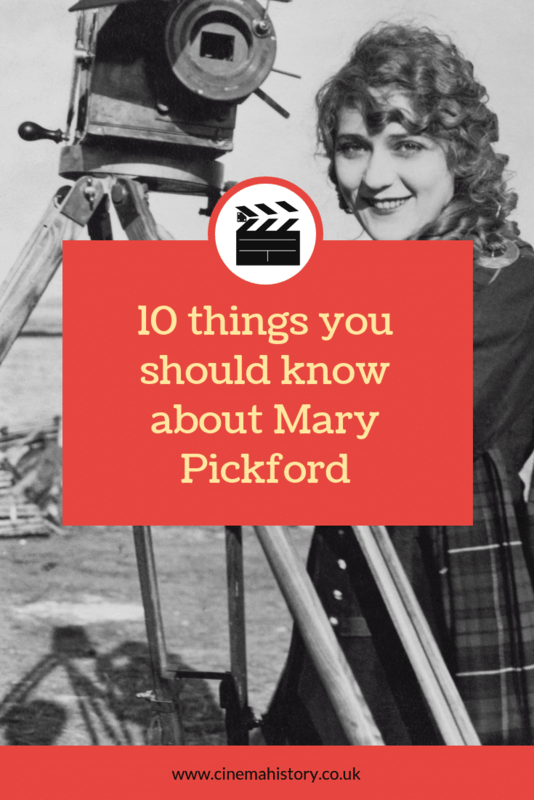 Mary Pickford appeared in over 220 short and feature films during her 40-year career. Pickford was a prolific actress. She appeared in 140 one-reeler films in the first four years of her career alone. The movie star made 52 feature length movies, most of which she made with her production company. During her first employment with Biograph, she appeared in at least one film per week. She is best known for playing young, poor girl characters. She played this role right up until she was 33. Despite her popularity, around half of her films are lost. In 1916, Pickford signed a new contract with Zukor’s Famous Players-Lasky company (later Paramount). She received a record-breaking salary of $10,000 a week. Zukor also agreed to give Pickford half of her film’s profits, with a guarantee of a little over $1,000,000. The contract stated that she had control over the production of the movies in which she starred. She demanded this after a previous film with Zukor, which she called the worse film she’d ever worked on. The acting was wooden acting by her colleagues, and the direction was terrible. Zukor agreed and delayed the release of the film. Zukor knew her talent and box office draw and knew her advice would be worth her salary. Pickford and her husband, Douglas Fairbanks, created their own production studio. In doing so, they had artistic control and a fair share of profits. In 1919, Fairbanks and Pickford acquired a plot of land in Hollywood to build a studio. The studio later became the home of United Artists, which Pickford founded with Fairbanks, William S Hart and, D.W Griffith. Hart later left to join Zukor at Famous Players-Lasky. Charlie Chaplin joined soon after. Today, the studio still stands, though Pickford or her estate no longer own it. Mary Pickford had a strong head for business, which she’d acquired as a child working in the theatre. She also had a good knowledge of what made a film successful. Pickford knew that a well-financed movie meant a higher quality finished product. She knew this would turn into sales at the box office. Her peers often praised her technical knowledge of filmmaking and direction. Her advice was often taken by directors, as they knew she was right. Silent movies are well known for their lack of Health and Safety. Dangerous stunts and precarious situations are part and parcel of acting in early cinema. Mary Pickford didn’t escape that. One film saw her sitting on a branch above some live crocodiles. Oh, and she has a baby in her arms. A live, 33-pound baby. On an actual tree branch. In another film, the horse she was riding panicked. It ran towards a busy intersection. Luckily, Pickford managed to get the horse under control and turned around. All while riding side saddle. Like most established stage actors of the time, Pickford felt that films were beneath her. Theatres carried a prestigious reputation, and appearing in a movie could ruin an actors career. But, Pickford’s family had fallen on hard times. She struggled to support her mother and her siblings on what she earned, and jobs were too irregular. She headed to Biograph, a local film company, where D.W. Griffith persuaded her to join his company. He later directed her in many of her early films. Mary Pickford met Douglas Fairbanks while on tour selling war bonds for World War I. Despite her marriage to fellow actor Owen Moore, she fell completely in love with Fairbanks. Her marriage to Moore was an unhappy one. He was an alcoholic and was often violent towards her. Pickford tried not to divorce him, due to her Catholic background. Fairbanks gave her a choice. Marry him, or he would leave. His wife had already filed for divorce on the grounds of him loving another woman. Not wanting to lose the man she loved, she decided to divorce Moore. Leaving Moore was not easy. He threatened to shoot her for leaving him. She fled to Nevada to be safe and speed up the divorce. Moore demanded a settlement of $100,000, which she granted. 8. Pickford worried about the public reaction to her marriage to Douglas Fairbanks. Pickford and Fairbanks married three days after her divorce from Moore. They married in a small ceremony at Fairbanks’s home. They worried about a backlash from the press and the public, so kept their marriage secret for three days. She would even travel around with tape over her wedding ring. Their fears were unnecessary. Fans rejoiced at the news, and the press loved Hollywood’s new power couple. Pickford and Fairbanks toured England for their honeymoon and supporters gathered for a glimpse of movie royalty. 9. Fairbanks’ son thought Pickford was a child. Pickford was only 5ft tall. Her tiny stature and youthful appearance helped her secure roles playing young children. When Fairbanks’s young son first met Mary, his new Stepmother, he thought she was a child who had come to play with him. Fairbanks’ guestbook showed that Chaplin was a constant guest at the “Pickfair” mansion. Chaplin even house-sat for the couple. Ever the comedian, when the pair returned home, Chaplin refused to let them in. The trio would often brainstorm together. The idea for Chaplin’s film The Gold Rush came from a stereoscopic card that Pickford gave to Fairbanks. Pickford also introduced Fairbanks to Zorro and Robin Hood, after she had read the books. These roles became synonymous with Fairbanks in later years.